In replacing a toilet seat last weekend I found this solution to the ancient problem of keeping the seat from sliding around. 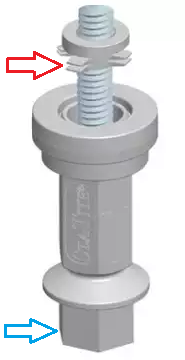 The regular solution holds the seat in place by applying sufficient vertical force to keep the bolt, which is smaller than the holes in the toilet, from moving horizontally. Lose that force and the seat slides. The STA-TITE solution solves this by using the little fins pointed to by the red arrow. The diameter of the fins is slightly larger than the hole, but get compressed as the nut (blue arrow) is turned with a wrench. The result is a tight fit that eliminates the need for that large amount of vertical force. And to avoid over-tightening, the bottom part of the nut breaks off when the right amount of force is reached. I really appreciate a well-designed product that eliminates problems that have been around for years.